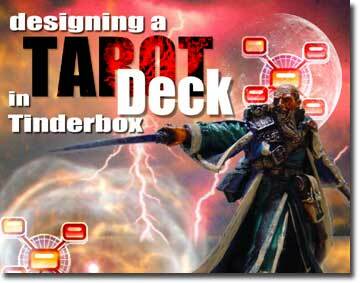 The challenge here is that the two 'Tarot' decks share common concepts, but are very different in many aspects. This is not a 'themed' Tarot deck but a tarot-like set of psi-active wafer of liquid crystal. The technical difficulties of future-tech aside, I have the challenge to use what I can of both to get a workable and well structured deck. There are already 29 named cards (there has been a published version by Games Workshop), but the whole deck has the full 78 cards like in the real-world Tarot. Those ards named are now to be mapped to their equivalents, all the time looking out for inherent differences and specific nuances both universes interpret differently. So now I have basically the 'major arcana' cards to match up. As the published Emperor's Tarot does not have any numbering of cards, I have to rely on concepts and themes to find appropriate matches. This is where Tinderbox comes in handy. I currently use a set of notes to collect notes about basic concepts and numerology etc, and also all and everaything I can find in the warhammer 'fluff' and various net-diskussion groups and forums about the topic. As the two sets of cards a in part radically different and also sometimes deceptively similar, I need to break down thing to very basic concepts and re-build up from there. The complex symbology and very elaborate lists of traditonal meanings of Tarot are of little use here. But my use of Tinderbox in this project goes beyond note taking and organizing. I will be using Tinderbox' map views and especially (sticky) adornments to map out the various concepts. In the end I want to build up some very 'illustrative' descriptions of the cards in the Emperor's Tarot. Descriptions of the actual look of a card. Actually illustrating the cards would be my dream, but that seems way beyond my scope. Not neccessarily skill-wise, but time-wise. [update 2006-12-22] The Games Workshop published Tarot deck I mention was a supplement to the White Dwarf magazine. It was intended as a game expansion for the Epic Scale range. The cards were used as a kind of 'strategy cards'. I have written a longer essay describing my process and the results so far. If I have enough interest I will publish it on my website.